Texas America Safety Company carries a full line of safety product storage containers. It is important to have easy access to your safety products. 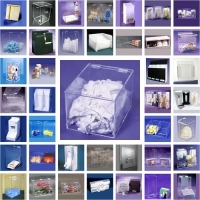 Therefore, it is a good idea to keep products stored safely in dispensers, as well as, storage racks. No matter what the safety product, we have a unit to safely store the item until needed. Safety products are important, but you must be able to store them properly. A pair of work gloves is useless if you end up losing them. If your safety products aren’t stored properly, they can get stolen, and you’ll find it difficult to stay safe at your workplace. We carry several different types of safety product storage containers. Our safety dispenser products are especially useful for general storage. They’re commonly used to store hooks, beard covers, hair nets, gloves and shoe covers, but you can store any type of safety equipment inside of them. We carry both large and small storage dispensers, so you can find the size that fits your work environment. Choose from several dispensers that are made to hold safety goggles, and we have many all-purpose dispensers, which are created to have a large capacity. 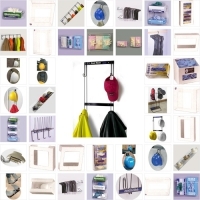 We even stock gloves dispensers and accessory bins. Most of our dispensers are made from hard, durable plastic, which can withstand plenty of abuse. Utility racks are also great for storing your important safety gear, and we stock several types of racks. The racks that we carry can hold hard hats, safety glasses, sanitation products and gloves. We even carry racks that are made for shoe and glove drying. Our inventory of Glove Guard bags contains several styles, and you’ll find several different colors to choose from. The Glove Guard bags are ideal for keeping your cell phones, water, parts and tools safe while you’re not using them. With a Glove Guard bag, you’ll always have your items ready when you need them. 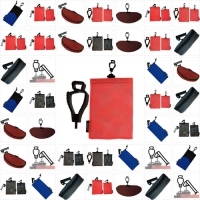 You might also want to check out our selection of lockout tagout hasps. These items are very important for locking up machinery. 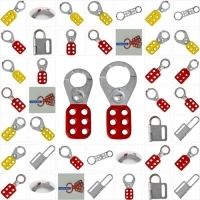 Unlocked machinery poses a serious safety risk, so you should lock it up with one of our stylish and functional lockout tagout hasps.